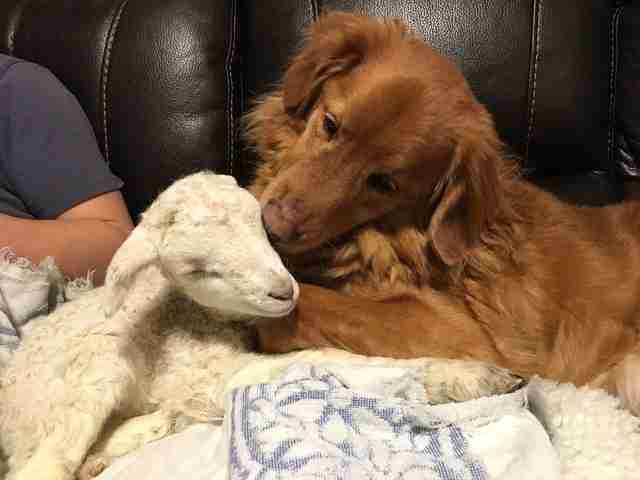 Even though his life lasted only two weeks, a little lamb named Jerry touched so many lives. 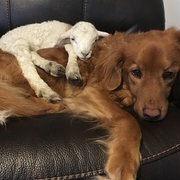 Jerry was rescued by Black Goat Farm and Sanctuary in Ontario, Canada, after he was born a runt on a local farm and rejected by his mom. The farmer didn't want to take the trouble to bottle-raise him, so Megan Mostacci, cofounder of the sanctuary, gave him the loving home he needed. That's where Jerry met a very special friend, Drake the dog. "Most lambs sleep on top of their mamas," Mostacci told The Dodo earlier this week. "And Jerry does this with Drake." And Drake quite obviously loved Jerry back. Even on Jerry's first night at the sanctuary, Drake was attached. "He was cleaning him, cuddling with him ... just being there with him," Mostacci said. But even though so many individuals were there for Jerry, he turned out to be very sick — beyond anyone's help. After he flopped over onto his side suddenly on Wednesday, Mostacci rushed him to the vet. Sadly, it turned out he had a sudden case of bloat — and as he was being prepped for emergency surgery his heart stopped. Little Jerry, who already formed so many friendships, was gone. "I cannot believe it," Mostacci, shocked and heartbroken, said. As incomprehensible as the turn of events was to the people who loved little Jerry, Jerry's absence was presumably even more puzzling for Drake, his best friend. 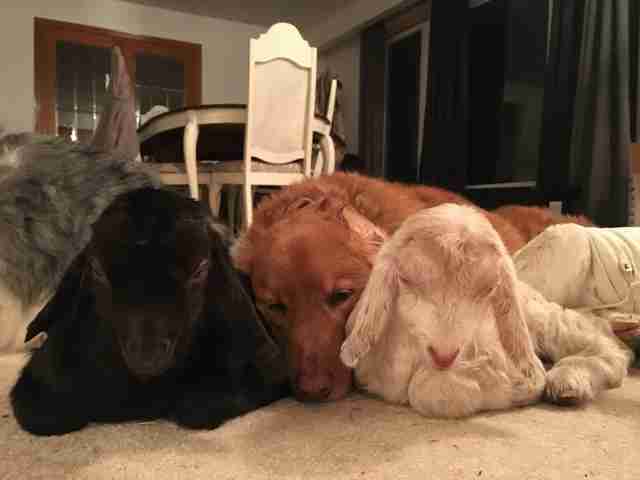 But animals are very intuitive. Drake kept looking for Jerry, even though he never came home from the vet. 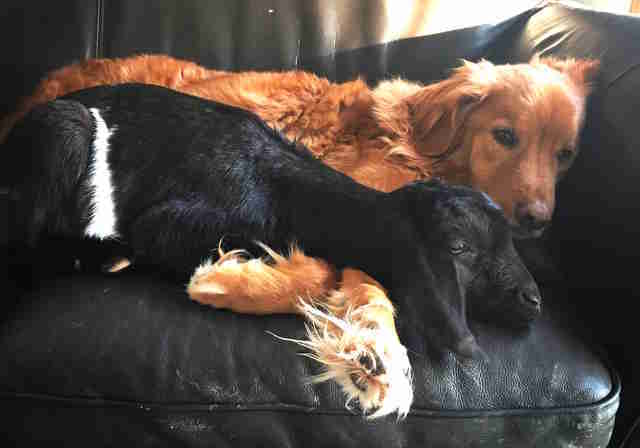 So another individual at the sanctuary had the sense that the dog could use some warmth and kindness: Dottie the goat came over and spooned with Drake on the couch. Dottie and her sister had been saved from a hoarding situation back in February. 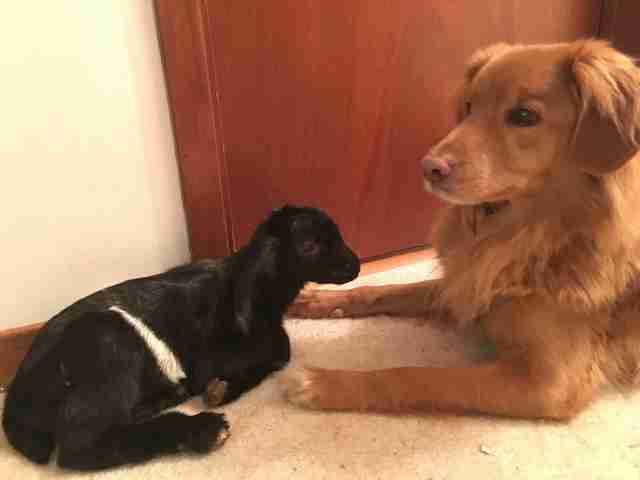 And Drake had been warm and welcoming with her, just as he had been with Jerry the lamb. So when Dottie went over and cuddled up to a heartbroken Drake, perhaps she was remembering how good he had been to her — or maybe she just thought he looked like he could use some warmth. "Dottie has been cuddling with Drake all morning," Mostacci said on Thursday. "She knows he’s sad." 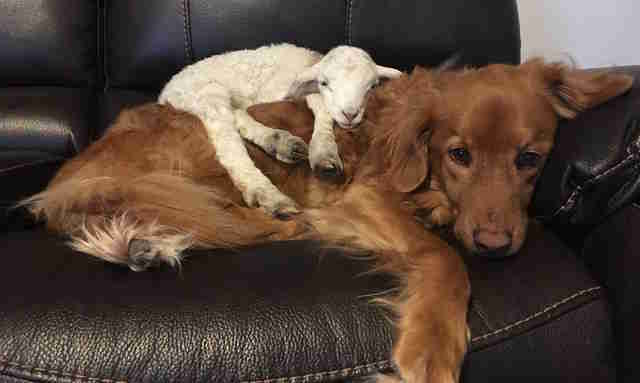 Wherever there's love, there's the risk of loss and heartbreak — but it doesn't obscure the memory of the little lamb. "Drake loves his babies so much," Mostacci added. Thankfully there's enough love to go around at the sanctuary to help everyone through a hard time. 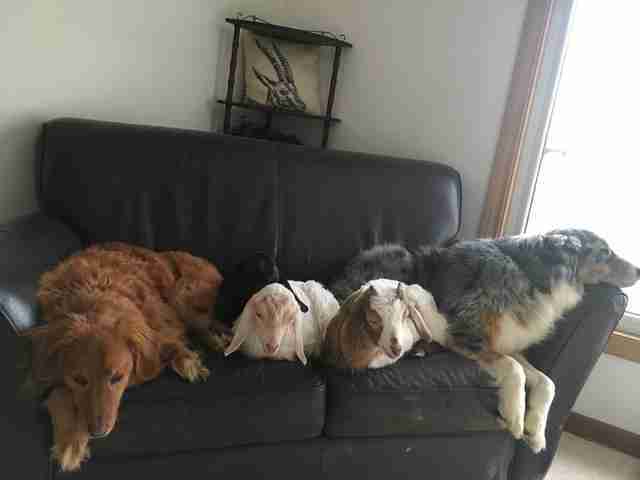 You can make a donation in memory of Jerry to Black Goat Farm and Sanctuary. 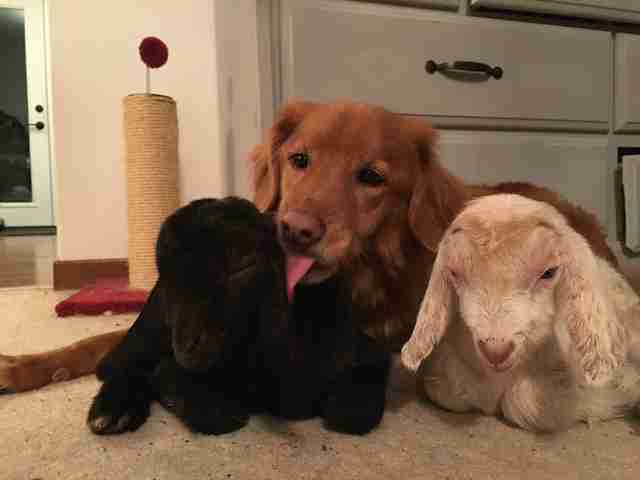 You can also follow Drake and his rescued farm animals on Facebook and Instagram.